The routine begins at the daybreak at these villages along the right and the left banks of the backwaters of River Tungabhadra in Koppal district. Fishermen get into their canoes. When the canoes are off the bank, the women folk back home or in the makeshift sheds start weaving fishing nets. As the canoe ferrying the fishermen and their catches reach the bank, the second team of fishermen wait for the action hoping to catch as many fish as possible. A serpentine queue of merchants welcomes the fishermen when they land with their catch. It is a quick action from there on. A specific rate is fixed for a fish depending upon its size and breed. The catch is bought immediately without much bargaining. By 9 am, the fishermen complete fishing, and by 11 am the business closes. By noon, neither the fishermen nor the merchants are seen at the place. The small fishing world around these hamlets lasts before noon. 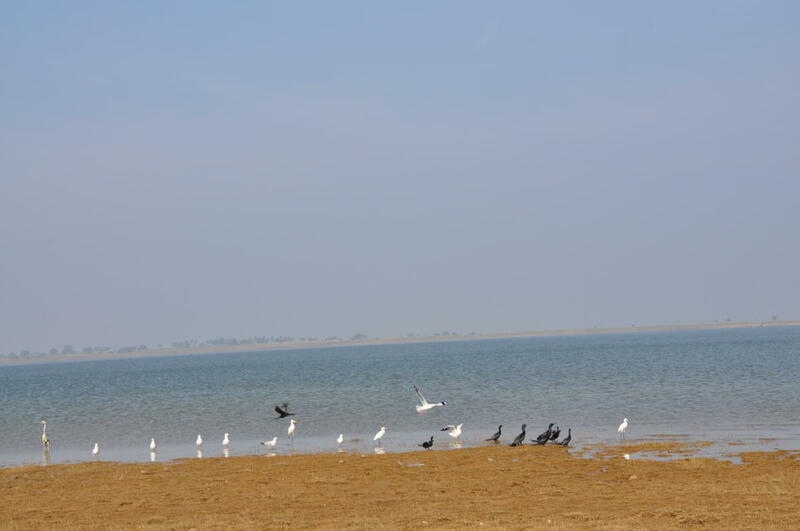 The reservoir fishing mainly takes place at Karkihalli, Lachanakere and Hyati Mundaragi villages along the left bank; Mainalli, Vyasanakere, Ladakanabhavi, Nakral, Mugur and Kitnur on the right bank. Once they are back at their houses, these fishermen engage in different activities. 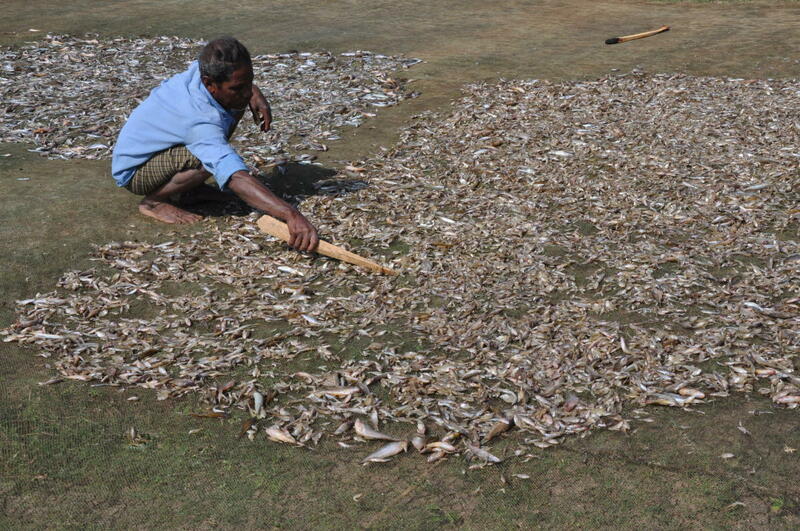 They spread the fish outdoors and let them dry in the open. They also help women in weaving fish nets and separate fish according to their breeds and sizes. A few fishermen stay at makeshift sheds along the banks and by tiny islands. They have a solar connection, this facilitates them work in the night, too. Music helps them break the everyday monotony. 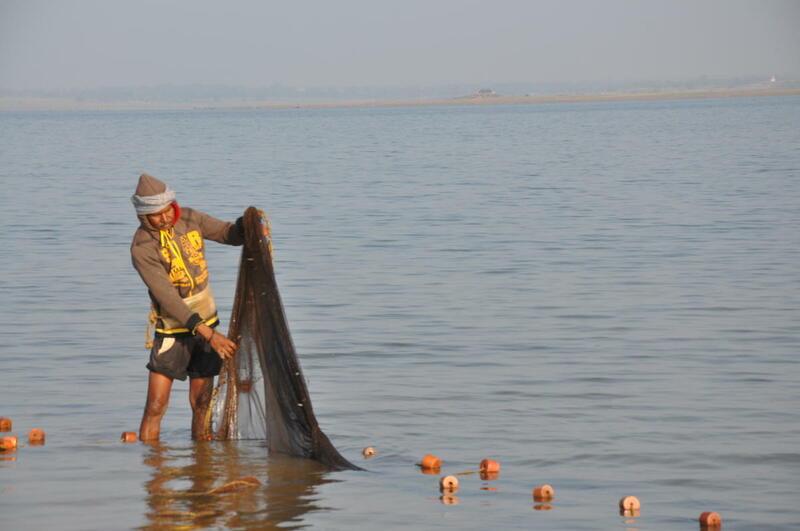 The fishing activity at the backwaters takes place based on a contract system. The government awards contract to local and outside fishermen. Those who bag the contracts employ the fishermen and provide them canoes, nets and other materials needed for the activity. The fishermen and contractors reach an agreement to share the earnings. There are strict guidelines about specifications of canoes and nets governing contractors and fishermen. Contractors are usually from Andhra Pradesh, Tamil Nadu and other neighbouring states, besides local contractors who participate in the bidding process. The tender period will be in effect for a period of six months. The fishing activity that spans for about six months registers transactions worth over Rs 1.5 crore. 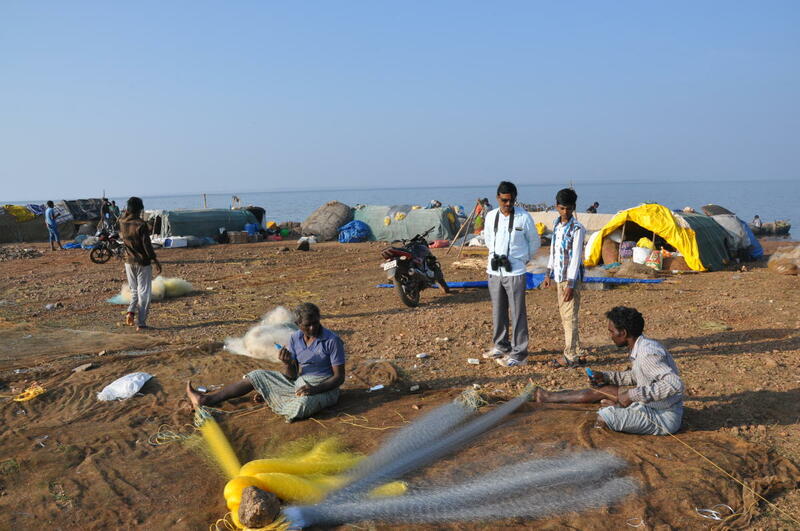 These fishermen adopt intensive labouring for fishing. The quantity of the catch ranges from a few grams to over a quintal. “The area for fishing shrinks once the summer sets in due to fewer backwaters. 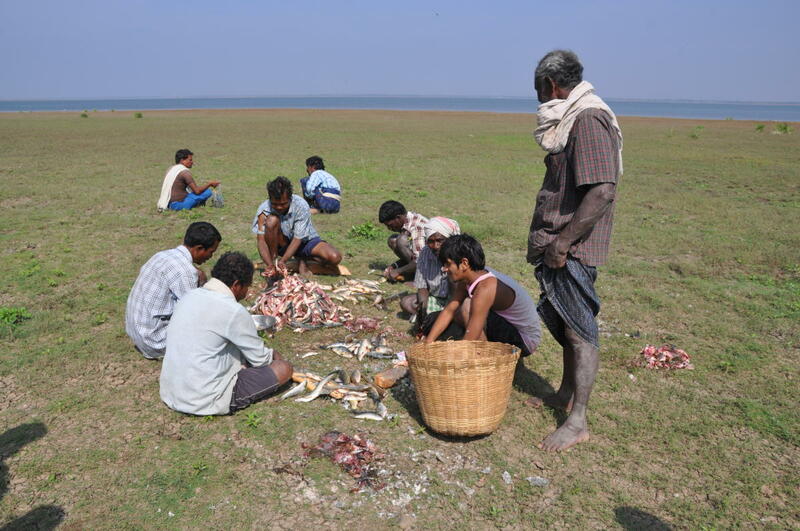 Then fishermen from both sides engage in intense fishing in the same locality,” Mabusaab, a fishing merchant, points out. He says there is good demand for the catch in the backwaters of Tungabhadra as they are freshwater fish. The fish from the Tungabhadra backwaters are shipped and sent by trains to Belagavi, Hassan, Kolkata, Mantralaya, Hyderabad and other cities. “The fish are wrapped and packed in polythene bags. The fishermen salt the fish so that the freshness and quality are not lost,” he adds. Each bag contains fish weighing about 60 kg. Priority is to ensure that fish are available to consumers at the right time, in the right place. Known for their quality, the fish from Tungabhadra backwaters cost about four times higher than the fish from coastal belt. Over a dozen breeds of fish are available in the backwaters. 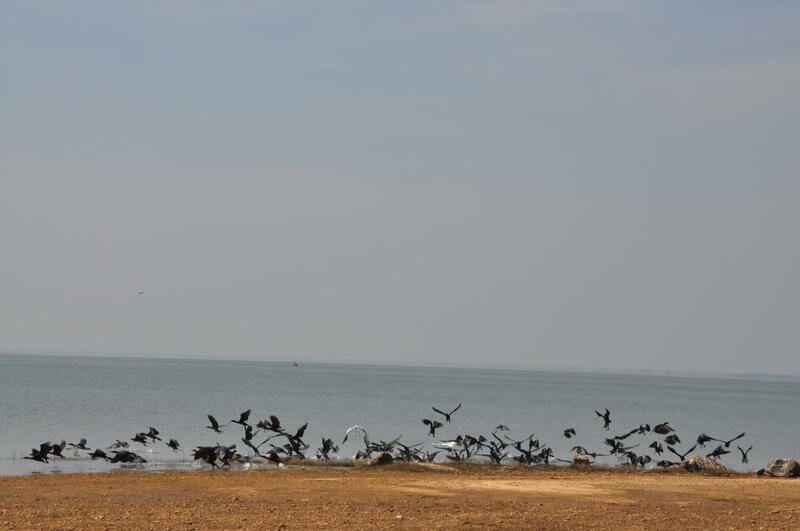 Locally, they are named havu meenu, wadli, cholumatta, girla, mosi, mettanajella, seegadi (prawn), nabbinka, pakki, donda and kuduri. “Due to its unique taste, havu meenu is in great demand,” Hussain Saab Nadaf, a contractor from Karikhalli, who has employed about 150 fishermen for the past 15 years, says.